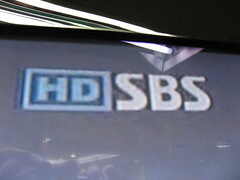 Since I see High Definition (HD) printed on the top right of World cup coverage, I wonder if it means anything. Is High Definition all that much better than a good analogue signal and a good monitor? With the industry pushing BlueRay or HD-DVD, touting “High Definition”, I am wondering if they really think people will care or notice. Almost everyone I know is familiar with DVD-rip, telesync and screener qualities. Most people are perfectly happy with VCD quality in Asia. I don’t hear anyone yearning for anything better than DVD. I for one would like to see CD media disappear altogether. This is how the latest HD (Hard Drive in this case) cam corders from JVC are marketed! Sidenote: That 5.1 Dolby sound often associated with DVD is also stupid. Most people hate having 5.1 speakers. Don’t get me started about the stupidity of widescreen. I hope the industry wises up a little.